What are the typical things that can go wrong when strawbale building?We thought we’d share what some of the common problems are when building with straw (whether you use a builder or do it yourself). These are problems we’ve overcome but it’s taken us years to work out how to do it properly. Also these problems are still happening today which other people have done and we are fixing. If only they had done some basic steps…A lot of it has to do with design. To make a job flow smoothly, get advice from experienced earth/strawbale builders throughout the design process. They may charge a fee for their consultation, but it is worth it. They can save you money (helping to keep costs to your budget if the designer, architect or even if you get carried away). They can also help ensure the home is designed around the building materials and solar passive, which will save you money. Don’t forget, if they are professional earth builders, they have done this numerous times and pick up easier ways to build each time they build. That experience is priceless. You don’t have to be locked in and have to build with them. Be upfront and tell them what you expect if you engage an earth builder to help with design.Walls start rotting. Make sure the walls have protection via eaves. Ensure you have a damp course under your bales so that if they do get wet, they don’t sit on the water and that the water can escape. Render fails. This a common problem so far as we can see in the industry. We don’t just mean hairline cracks. We mean the render is crumbling off the walls. There are many different ways to render a strawbale wall. We mainly work with lime renders as we’ve found them more hardy to rain and wind. Some straw renderers were using concrete but this isn’t promoted these days as the walls can’t breathe. Others may use pure earth renders, however they tend to fail as the walls wash away over time and erode. Lime renders for external walls are more robust to the elements. Ask your builder what they use. You will also need to seal and maintain your walls with a waterproof but breathable coat to keep it protected (from UV and sun damage). If you want a tried and tested way, use a strawbale renderer who has done it before or has been in the industry for a long time. The only thing is that costs can blow out because strawbale renderers find it difficult to quote the job. So the longer it takes them to render, the more it costs you. There aren’t a lot of strawbale builders who can accurately quote how much it will cost you. Make sure whoever renders for you guarantees their work. If you have a legal contract with them, they are legally liable to fix any work they do for 7 years. Have a contract with each of your subcontractors, especially the ones doing over $12,000 of work for you. This also keeps them to a time frame (acts of God, or delays in materials or subcontractors can delay a job). Ensure that if you have to do work or get materials, that it is done before they arrive. Follow up your suppliers and workers. Tradies are busy, friendly reminders help them. Did we mention to have a written contract with your subbies? It outlines what work they will and won’t do. Speak with others to find out costs you have missed. Put together a detailed list of things you need (house costs as well as council fees, engineer’s fees, earthmoving, driveway or driveway, connection to services, BASIX certificate, drawer’s fees, water tanks, landscaping, fencing, plus misc because you will miss costs). Get accurate quotes for these beforehand. Builder or tradespeople doesn’t do what you expect them to. Ask yourself if you like your builder or tradie. Afterall, you’re going to work with them for a long time. You’ve got to like them to begin with! On a personal level do you both understand the same rules and do you respect one another. This is important for starting what can be a 12-18 month partnership together. You need to be able to have trust in one another so you can both work together to achieve the goal of building you a home. Check that the builder and contractors you choose have a relevant licence and the licence number matches the company that you’re dealing with. It’s easy to do and can save you a lot of heart ache. Ask to see previous work they have done and speak with the clients to find out what the pros and cons are. Have they done straw bale building before, if they don’t, do they want to get things right and are open to earth building? Otherwise they may try and talk you out of it. Having years of experience in earth building does make a difference. Read, do your research and we recommend doing some workshops if you’re going to do some of the work yourself. Other NewsWe are still the Secretary for the Australasian Straw Bale Building Association (AUSBALE) whose goal it is to help promote straw bale building. If you would like information and forums, check out the Ausbale websitewww.ausbale.org.au.Mudgee Small Farm Field Day is coming up rapidly. Book the date to see the finished strawbale shed and see some demonstrationsFriday 15th & Saturday 16th of July, 2011. Straw + Earth Homes we’re building in 2011.We’re back on track after the wettest summer on record slowed down jobs and the QLD floods pushed us back. It’s been an interesting couple of months to the year but the jobs we started at the end of the year have all dried out and on track.Michelle and Gordon chose sharp, square edges to the finish of their walls. 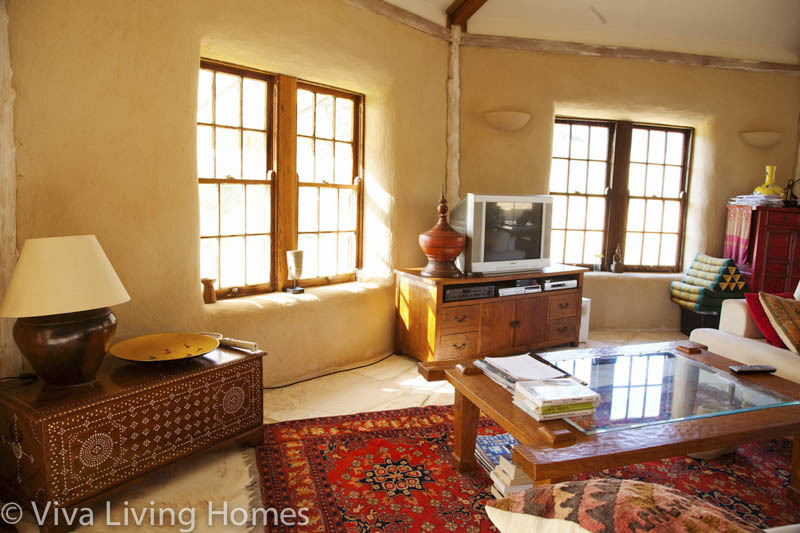 It is slower to do but who said you can’t have a contemporary look with straw bale walls? !Margaret’s light straw home has dried out (the internal walls had trouble drying with six months of rain and overcast conditions). With heaters, a few days of summer heat and fans dried them out so we can start to render. We’ve had some wonderful WWOOFERS (willing workers on organic farms) help on this house. We’re rendering Alex’s home in Hazelbrook which has transformed the home. Getting the first coat of render on is a milestone. We’ve also been working with a couple of clients, one in the Blue Mountains and one in Tamworth who want to retro fit their homes to be made of straw bale and cob. Retro fitting is not something we ordinarily do though as there’s a lot of unknowns (we prefer projects where we can quote accurately). Sam is still helping Rocky Elsom and his family build their sustainable home in the Eastern Suburbs of Sydney.